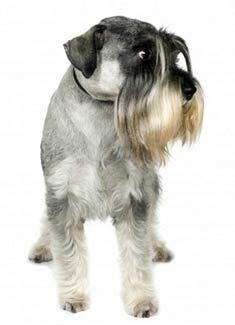 With its whiskers, beard and eyebrows, the Standard Schnauzer has a rather intense look. This is a medium sized dog with a rectangular shaped head, and the body gives an overall square impression. The Standard Schnauzer originated in Germany. Standard Schnauzers may be salt & pepper or solid black. The Standard Schnauzer's outer coat is wiry and harsh while the undercoat is dense and soft. The Standard Schnauzer must be brushed daily to avoid matting and must be trimmed in the fall and springtime. This dog breed has no doggy odor and is non-shedding. A lively and protective dog breed, the Standard Schnauzer makes an excellent guard or watch dog. Standard Schnauzers can become overprotective if not properly socialized. Standard Schnauzers require confident firm owners and do best with older children. Standard Schnauzers are generally very healthy. The Standard Schnauzer can be expected to live about 15 years. Find Standard Schnauzer Puppies with our Free Breeder search!